From municipal water treatment plants to industrial cooling ponds, corrosion is breaking down concrete and steel. The coatings industry has developed key advances in epoxies, polyureas, polyurethanes, and acrylics to help prevent structural deterioration. New resin technologies and improved formulations are producing better performing coating systems that offer higher solids products with higher film build and better edge protection. These new coating technologies, which meet federal requirements for volatile organic compounds (VOCs), offer productivity and performance advantages to minimize service interruptions, extend maintenance budgets, and preserve water quality. 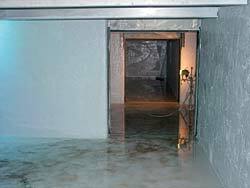 Historically, epoxy coatings have been the first line of defense for immersion and potable water service. Their ease of application and affordability made these coatings a popular choice. Today, epoxies remain at the forefront of coatings technology, protecting concrete and steel surfaces for tanks and pipes containing or conveying potable water, freshwater, saltwater, and wastewater. Epoxies also are ideal for use on floors, drains, clarifiers, sumps, and slabs and also can be used as part of a system for tank exteriors. The most recent generation of epoxies has low permeability, which provides excellent protection from permeation, cracking, and chemical and corrosion resistance. Many of these epoxies also offer a range of crosslink densities (the degree to which chemical cross-linking occurs during polymerization). Generally, the higher the crosslink density, the more resistant the coating will be to chemical agents and corrosion, however, a coating with the highest crosslink density may not be the best choice for a particular environment. Many factors contribute to determining the best coating system, such as the environment, specific chemical exposure, and substrate condition. Some epoxies have high solids content. When a coating is high in volume solids, it typically offers higher film build and better edge retention for improved coverage over sharp edges, corners, and welds. Today's epoxies also are designed to comply with Clean Air Act standards for low or zero VOC emissions and have minimal odor. a combination of these capabilities. These can be applied by conventional spray methods or, for those incorporating aggregate, by trowel. Higher solids and higher film build epoxies have changed the standard in the potable water tank marketplace to a two-coat high solids, high build, fast-drying polyamide epoxy certified by NSF to Standard 61 as a tank lining for potable water storage tanks. Tanks now can be out of service for shorter time periods because only two coats of epoxy are needed and the coats cure quickly. This coating system also meets American Water Works Association standard Inside Coating system No. 1. When applied properly, this system protects surfaces for 10 to 15 years. Polyurethane and polyurea coatings have been used successfully for more than 30 years. While their performance can be similar, they have distinctly different chemistries. Polyurethanes are formed from the reaction of polyol-containing resins and isocyanates, while polyureas are formed from the reaction of amines and isocyanates. Based on how they are formulated, these coatings cover a wide spectrum of capabilities. For example, the properties of polyurethane and polyurea coatings can range from relatively good chemical resistance and low flexibility to high flexibility with reduced chemical resistance. Polyurea and polyurethanes are an alternative to more traditional epoxies, requiring the expertise of certified contractors with the proper equipment for application. These coatings are ideal for many water industry uses. They are recommended for application on concrete or steel, including large diameter pipes, clear wells, filter beds, tank linings, and secondary containment. They will resist hydrogen sulfide and are ideal for application on immersed surfaces. Some are U.S. Department of Agriculture-approved and meet ANSI-NSF 61 Standards. Polyurea and polyurethanes dry and cure very quickly, and structures can be put back into service in as little as one day. These coatings also can be applied to very high film builds (up to 250 mils or greater) in a single application with little odor and almost no VOCs. Because these coatings have excellent tensile strength, elongation properties, low permeability, and high impact resistance, they are ideal for applications where flexibility is important. Acrylic clear coat finishes offer an attractive, protective finish for high-visibility outdoor structures, such as water tanks. Typically, these finishes are used over a topcoat to provide additional resistance to ultraviolet exposure and to increase color and gloss retention. The best quality acrylic coatings can preserve and protect coating appearance 15 years of service, making them ideal for use on city or corporate logos and signage on highly visible water storage tanks. Acrylic clear coats also dry quickly and are easy to apply. Some of these coatings also emit low VOCs. The high gloss finish resists graffiti. Until a few years ago, water tanks had to be drained before exterior surfaces could be painted. Condensation, common on water tanks below the water line, made it necessary to drain tanks to prevent surface moisture from causing coating failure. But moisture-cure urethanes (MCUs) have changed all this. A subset of the polyurethane family, MCUs are easy to use and durable. These coatings can be applied on water tanks, clarifiers, and secondary containment. They are designed for low temperature (down to 20 degrees Fahrenheit) or high humidity applications. MCUs are VOC compliant and resist abrasion and chemicals. They are available with a wide range of physical properties and can provide good color and gloss retention. Recent advances in MCU manufacturing process have made it possible to extract all moisture from the coating, which extends shelf life and coating stability. The process allows for custom color matching with special field tint bases. One of the most successful coating systems used to repaint in-service water tanks includes a micaceous iron oxide (MIO), aluminum-filled primer or intermediate coat. The pigments in this coating align themselves parallel to the substrate in closely packed layers. The overlapping pigment particles form a dense barrier against moisture and other corrosion promoters and also reinforce the coating. When power-rolled onto less than ideally prepared substrates, the MIO-aluminum filled coating has provided superior "wetting out" properties and adhesion. It has even protected severely pitted areas on the wet risers of inadequately maintained tanks. Each water tank painting project is unique. When the existing coating system must be completely removed (because it contains lead-based paint, for example), a zinc-containing moisture-cure urethane coating often provides the best corrosion protection. Coatings customers should expect on-site assistance for coating selection, application, and follow up from a coatings supplier. Some suppliers provide job-specific advice from experts accredited by the National Association of Corrosion Engineers (NACE). A corrosion expert should be up-to-date on the most recent government mandates, including local and federal environmental regulations. He or she also should be well-versed in industry standards and trade association recommended practices. Advice is vital for specific surface preparation guidelines. The success of any coating application depends on whether the correct steps are taken to ensure the best results. Surface preparation is even more critical when coatings are used for immersion service. Corrosion experts also help determine the long-term cost benefits of using one coating over another. Just like any building product, the costs associated with using a coating (such as labor and materials) should be in direct proportion to its expected service life. A simple rule of thumb is that high quality coatings last longer, so they offer reduced lifecycle costs. Using a coating with a shorter lifecycle results in a greater expenditure of maintenance dollars over time because of the labor and material costs associated with replacing the coating system sooner rather than later.